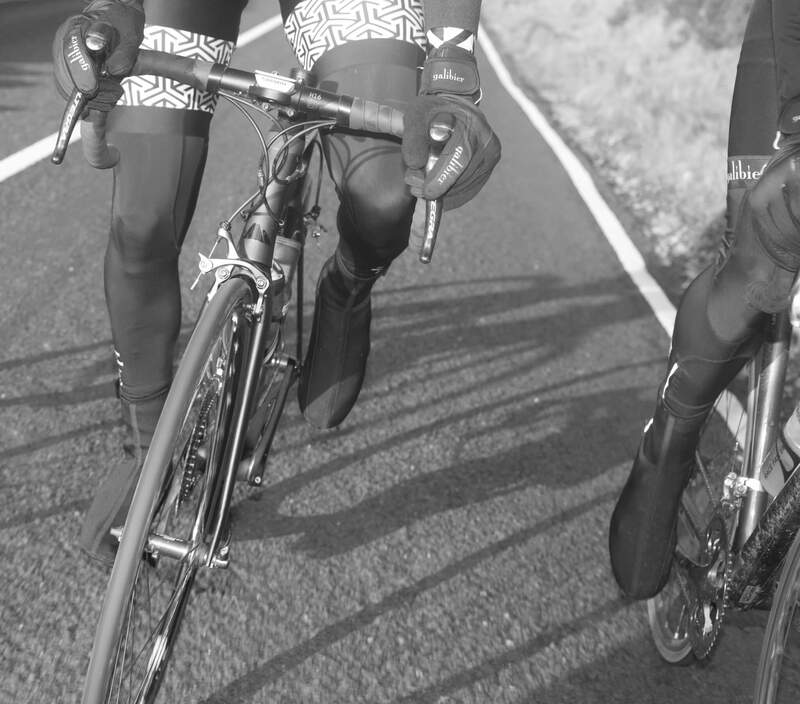 Neoprene is the warmest fabric for overshoes, but it can be bulky and restrict smooth pedalling. 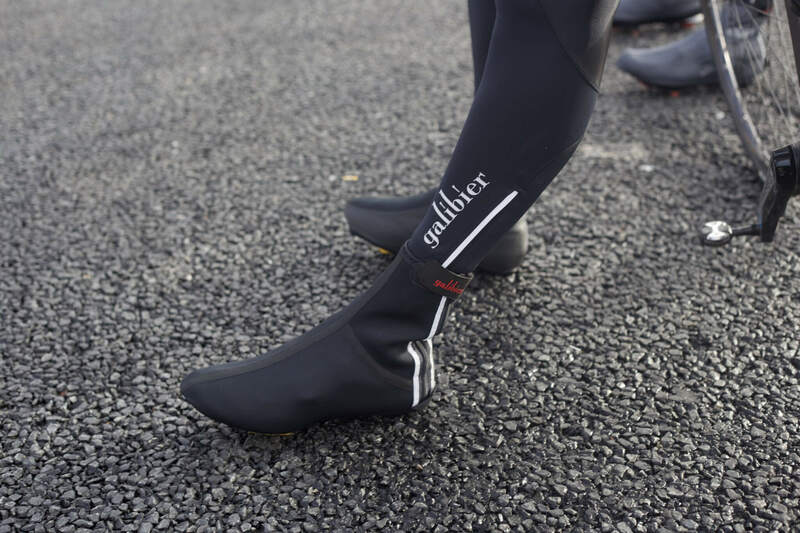 So our Barrier Overshoes are made from a High density Neoprene tailored, neat, to let the feet spin. We have utilised a waterproof, PU fabric on the crank side so that there is only 1mm, extra material between the shoe / ankle bone and the crank to prevent rubbing. This PU material also fights off the road spray the front tyre throws at the downtube or front mudguard. ALL internal seams are taped. Our cleat hole is the large, regardless of your personal cleat setting they will NOT get trapped in the pedal. We OFFSET the sturdy Zip, away from the Achilles to remove any possible irritation. Starlite reflective trim each side of the YKK zip to keep you safe and a tab at the bottom of the zip means they are simple for fitting and removal. Designed for road cycling shoes. Overshoes love cycling. All overshoes will die quickly if you walk in them. Cycle don’t walk. Concrete eats overshoes- so be nice to them- penguin walk on your heal and cleat. Least chance of slipping and the toe area will remain free from ground contact. Worn twice so far, great snug fit and warm feet, quality materials, good extra cleat space in this model. Robust zip and safe reflective strip to back. Very well constructed product at a very reasonable price, sure to do me many winters. Seem to do the trick in a shower but wet will get through once the rain starts to hammer down. Wet actually appears to be coming through the seam where the neoprene and PU fabric meet. I have to admit that having worn them in temperatures under 5 degrees, my feet were numb. This was with merino wool socks on too. So definitely not the warmest option. Construction of the overshoes seem great. Time will tell whether they hold up to excessive use through the Winter months. Worn them for 2 months now, commuting, 7 miles each day. Fantastic quality and showing no wear and tear. Delighted. Quality is good, but they do run very small. Order a size up. Seriously quality product. Worn in the wet and in temperatures around zero they have kept my feet toasty and dry. With size 11 feet the XL fits snuggly, and the gap on the sole leaves plenty of room to clip in without interference. They beat anything else on the market that I have tried and their price blows the competition out of the park. 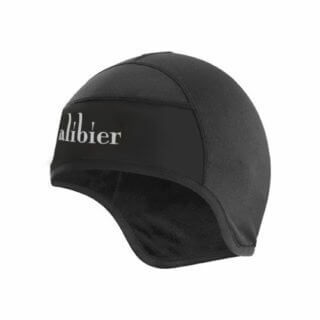 For the money there is nothing better.Superb quality, snug and waterproof. Fantastic. Wonderful overshoes. Haven’t had a drop of water get through and they’re super warm. Perhaps even too warm when the temperature hits around 10 degrees. Careful with putting your foot down, like with all overshoes, and avoid contact with the ground. Very reasonably priced. Fit like a glove, keep the muck out, keep your feet warm, lightweight, durable. No gap at the top to let the water in. Could you ask for more??? 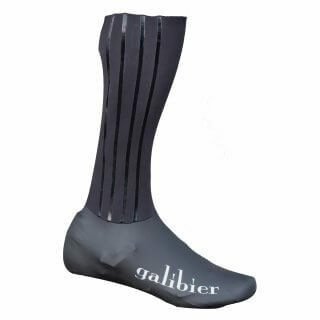 purchased these from the site on monday and they arrived a day later just in time, i emailed Galibier to be sure i ordered the correct size. 10.5 and ordered an XL, they fit perfectly. these have a super quality feel to them and you can tell they they arent just threw together, off center zip and the PU materail is a nice touch! After a few hundred KM in them I can safely say it’s a great product! Worn these a few times now in all sorts of conditions. My feet are still dry hence the four stars.. can’t really fault them except they are a bit on the snug size!! But I did just guess my size rather than checking the size chart so that’s all my fault..
Read a few reviews and decided these look good for the money.went for a size up as suggested.The overshoes looked the part but sadly in cold conditions the cold strikes through the thin inner section leading to cold feet & no better in the wet as water leaks through the taped seams also. If you want a good winter overshoe spend a bit more. Hello John , please return the shoes for refund as your not happy with them. The taped seams to work, ive tried them with a pressure hose! but water does eventually get in down the leg or up from the cleat hole, as in all overshoes. 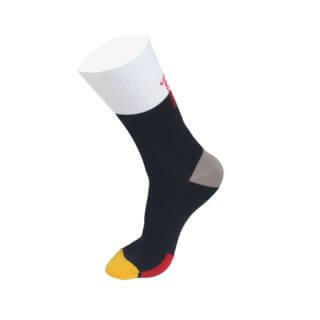 They are made in san Remo in a factory that produces for Castelli and Nalini, so it not a ‘cheap’ overshoe, just just sell direct for less to the customer. I’ve worn these overshoes several times this winter and have found them to be the best overshoe I have ever worn. 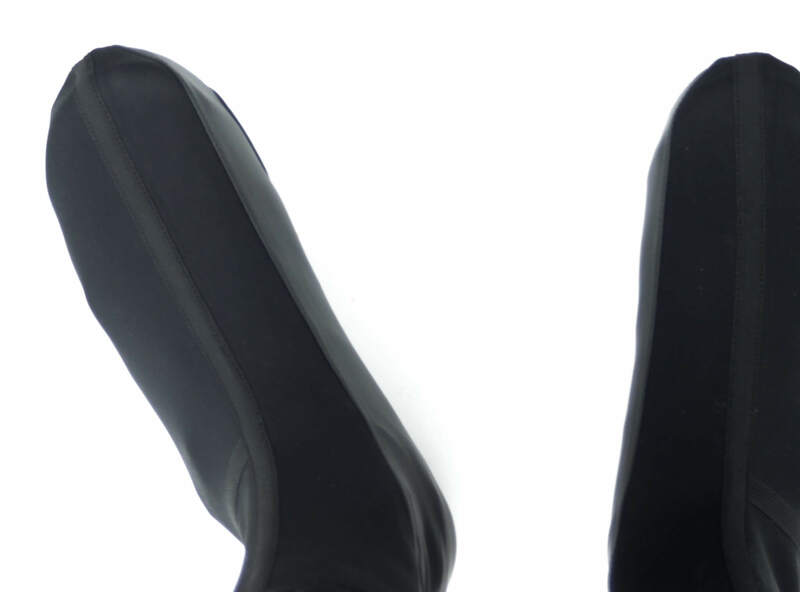 They fit snugly and are very durable, unlike many other overshoes at least twice the price that I have used in the past. In 2 to 5 degrees Celcius temperatures I have found that they keep my feet adequately warm, no cold feet. I have not worn them yet in continual rain for an extended period of time however I have worn them on wet road rides and found that they have kept my shoes completely dry. I recommend these overshoes. Tested these today and am very pleased. The sizing is snug, but this is an advantage once their as they’re nice and neat (not like other winter overshoes I’ve had). Very happy with them. Considered getting Assos and glad I didn’t as these are great. I like these overshoes, especially for the low cost. They kept my feet warm for an 1,5 hour ride in -4 Celsius wearing warm socks. I almost never ride in the rain, so I can’t say anything about their water resistance. However, consider sizing up. The fit is very snug. My normal shoesize is 42, but the cycleshoes I use (Decathlon 500) are 44 in size because 42 or 43 wouldn’t fit my feet. I ordered these overshoes in size L, but I have difficulties getting them around the pedal clips. Maybe XL would have made this easier. So: when using the sizing table, look at the actual shoesize and not your ‘normal’ shoesize. Best shoe covers I’ve owned. Big fan of the material and the fit. I purchased large and have size 10/44 feet wearing bont shoes they are a tight fit but I prefer that over anything loose. Offset zips brilliant! just seems obvious now you’ve done it but take the zip nagging your Achilles out of the equation!